.. you, yourself, with a feeling of dignity which you cannot altogether conceal, sally forth to the booking-office to secure your place. Here a painful consciousness of your own unimportance first rushes on your mind - the people are as cool and collected as if nobody were going out of town, or as if a journey of a hundred odd miles were a mere nothing. You enter a mouldy-looking room, ornamented with large posting-bills; the greater part of the place enclosed behind a huge, lumbering, rough counter, and fitted up with recesses that look like the dens of the smaller animals in a travelling menagerie, without the bars. Some half-dozen people are 'booking' brown-paper parcels, which one of the clerks flings into the aforesaid recesses with an air of recklessness which you, remembering the new carpet-bag you bought in the morning, feel considerably annoyed at; porters, looking like so many Atlases, keep rushing in and out, with large packages on their shoulders; and while you are waiting to make the necessary inquiries, you wonder what on earth the booking-office clerks can have been before they were booking-office clerks; one of them with his pen behind his ear, and his hands behind him, is standing in front of the fire, like a full-length portrait of Napoleon; the other with his hat half off his head, enters the passengers' names in the books with a coolness which is inexpressibly provoking; and the villain whistles - actually whistles - while a man asks him what the fare is outside, all the way to Holyhead! - in frosty weather, too! They are clearly an isolated race, evidently possessing no sympathies or feelings in common with the rest of mankind. Your turn comes at last, and having paid the fare, you tremblingly inquire - 'What time will it be necessary for me to be here in the morning?' - 'Six o'clock,' replies the whistler, carelessly pitching the sovereign you have just parted with, into a wooden bowl on the desk. 'Rather before than arter,' adds the man with the semi-roasted unmentionables, with just as much ease and complacency as if the whole world got out of bed at five. You turn into the street, ruminating as you bend your steps homewards on the extent to which men become hardened in cruelty, by custom. It strikes a quarter past five as you trudge down Waterloo-place on your way to the Golden Cross, and you discover, for the first time, that you were called about an hour too early. You have not time to go back; there is no place open to go into, and you have, therefore, no resource but to go forward, which you do, feeling remarkably satisfied with yourself, and everything about you. You arrive at the office, and look wistfully up the yard for the Birmingham High-flier, which, for aught you can see, may have flown away altogether, for preparations appear to be on foot for the departure of any vehicle in the shape of a coach. You wander into the booking-office, which with the gas-lights and blazing fire, looks quite comfortable by contrast - that is to say, if any place CAN look comfortable at half-past five on a winter's morning. There stands the identical book-keeper in the same position as if he had not moved since you saw him yesterday. As he informs you, that the coach is up the yard, and will be brought round in about a quarter of an hour, you leave your bag, and repair to 'The Tap' - not with any absurd idea of warming yourself, because you feel such a result to be utterly hopeless, but for the purpose of procuring some hot brandy-and-water, which you do, - when the kettle boils! an event which occurs exactly two minutes and a half before the time fixed for the starting of the coach. The first stroke of six, peals from St. Martin's church steeple, just as you take the first sip of the boiling liquid. You find yourself at the booking-office in two seconds, and the tap-waiter finds himself much comforted by your brandy-and-water, in about the same period. The coach is out; the horses are in, and the guard and two or three porters, are stowing the luggage away, and running up the steps of the booking-office, and down the steps of the booking-office, with breathless rapidity. The place, which a few minutes ago was so still and quiet, is now all bustle; the early vendors of the morning papers have arrived, and you are assailed on all sides with shouts of 'TIMES, gen'lm'n, TIMES,' 'Here's CHRON - CHRON - CHRON,' 'HERALD, ma'am,' 'Highly interesting murder, gen'lm'n,' 'Curious case o' breach o' promise, ladies.' The inside passengers are already in their dens, and the outsides, with the exception of yourself, are pacing up and down the pavement to keep themselves warm; they consist of two young men with very long hair, to which the sleet has communicated the appearance of crystallised rats' tails; one thin young woman cold and peevish, one old gentleman ditto ditto, and something in a cloak and cap, intended to represent a military officer; every member of the party, with a large stiff shawl over his chin, looking exactly as if he were playing a set of Pan's pipes. 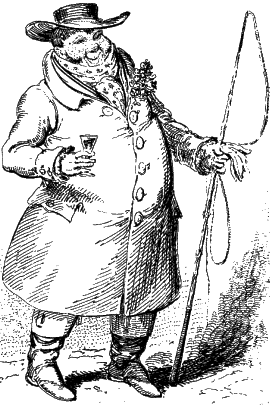 'Take off the cloths, Bob,' says the coachman, who now appears for the first time, in a rough blue great-coat, of which the buttons behind are so far apart, that you can't see them both at the same time. 'Now, gen'lm'n,' cries the guard, with the waybill in his hand. 'Five minutes behind time already!' Up jump the passengers - the two young men smoking like lime-kilns, and the old gentleman grumbling audibly. The thin young woman is got upon the roof, by dint of a great deal of pulling, and pushing, and helping and trouble, and she repays it by expressing her solemn conviction that she will never be able to get down again. 'All right,' sings out the guard at last, jumping up as the coach starts, and blowing his horn directly afterwards, in proof of the soundness of his wind. 'Let 'em go, Harry, give 'em their heads,' cries the coachman - and off we start as briskly as if the morning were 'all right,' as well as the coach: and looking forward as anxiously to the termination of our journey, as we fear our readers will have done, long since, to the conclusion of our paper.